Of all the things to fall in love while traveling, I fell in love with the Metro! I am crazy about metro trains, rides, stations etc that I get to experience in different parts of the world. My last tryst was with Paris but I didn’t get around to write about Moscow Metro. So that goes first! 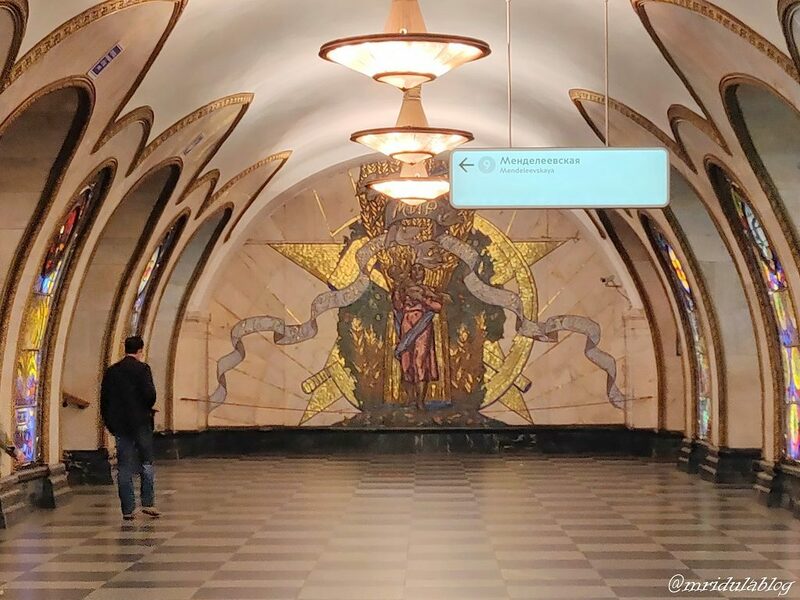 The Metro Stations of Moscow are in a league of their own! When I posted the images on Facebook and Instagram friends commented that they look like the lobby of a five star hotel rather than a metro station! And they are right! 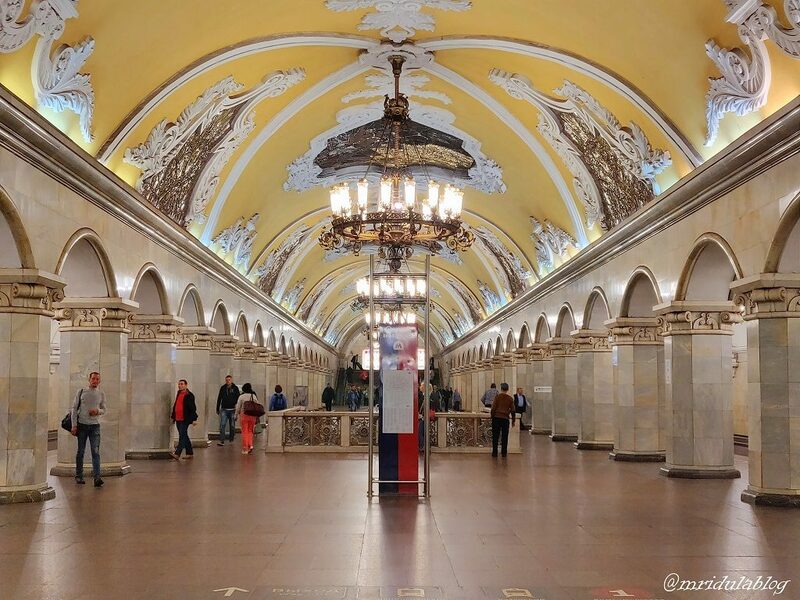 There are many guides on the internet which will list the top metro stations in Moscow. I would say start will the circle line (also known as Koltsevaya Line and use the Yandex Metro App to get around). Some of the most beautiful stations are on this line. 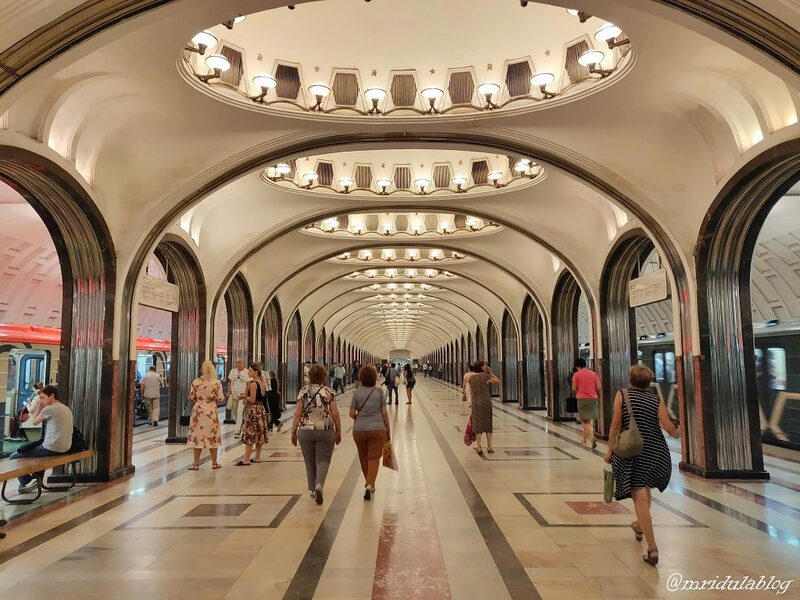 Below is the list of things to know before you set to explore Moscow using the Metro! 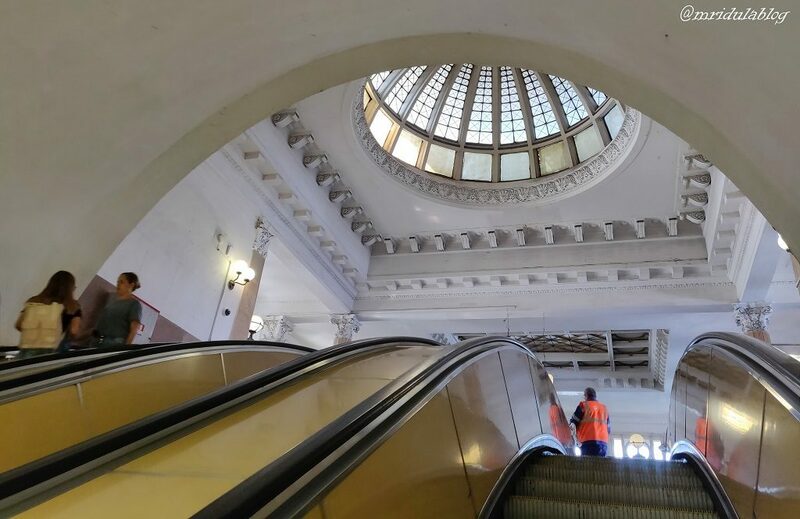 How to buy ticket on the Moscow Metro? 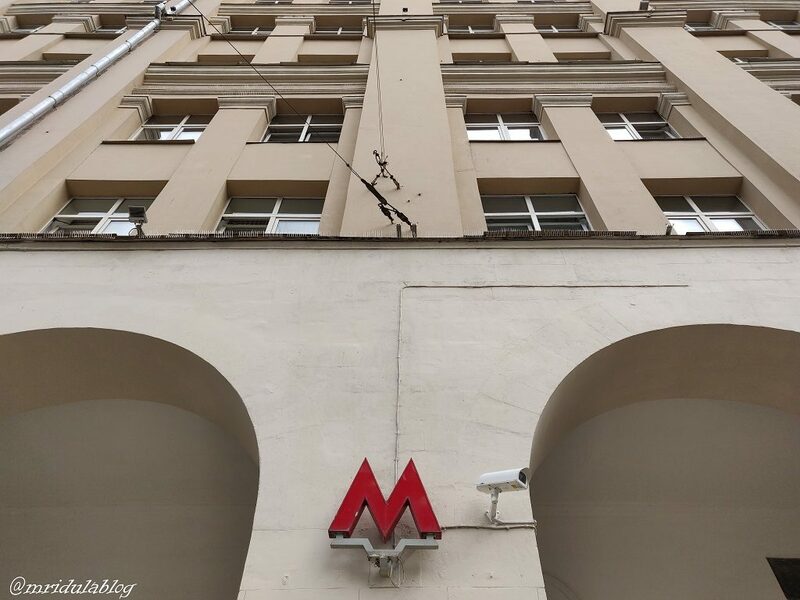 With station names like Mayakovskaya and Novoslobodskaya how do you go around buying a ticket on the Moscow Metro? Actually it is quite easy. You buy the tickets by the ride, whether you wish to travel one stop or five or till the end of the line or whatever. Say you wish to go to Teatralnaya from Paveletskaya and come back, that will be counted as 2 rides. So simply tell the person behind the counter you need two tickets and you are good. Now if you wanted to go to Belorusskaya from Dinamo and back that is again two rides. So you need not worry about how far or less you are traveling, you buy by number of rides you wish to take, see it is easy. On most of the metro stations that I used there was a counter marked “We speak English” I can’t vouch for every station but I saw it whenever I bought a ticket and yes they indeed spoke English at that counter. I also saw that they had a tab which gave the metro information in Chinese. But I soon bought a day card and that was the end of my buying individual tickets which takes us to the next topic. Day passes are available and I bought a three day pass which if I remember correctly cost me 440 Rubles. It is a great way to explore the city. Having a day pass makes a lot of sense for someone who likes to wander and change her plans every 15 minutes. I can get down anywhere I want and continue again without worrying about tickets. It is cheaper to buy a pass if you wish to use the Metro multiple times a day. Are the station names in English? When I was doing the web search before my trip, many web pages said the metro station names are written only in Russian and the announcements are only in Russian. So you need to count the stations and get down. That is no longer true. The name of the stations are written in English and most routes have announcements in English post the World Cup Football 2018. Yes photography is allowed on Moscow Metro. There are designated selfie spots too. 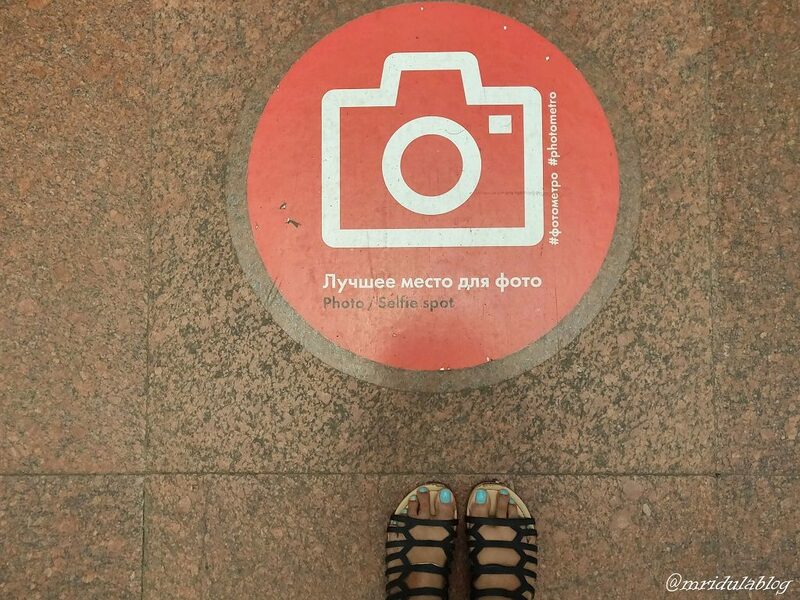 Moscow Metro has hashtags #photometro I had no problem in taking pictures anywhere on the stations. Why is the station not exactly as listed in the beautiful stations list? Apart from checking the name of the station you also need to check on which line they are. 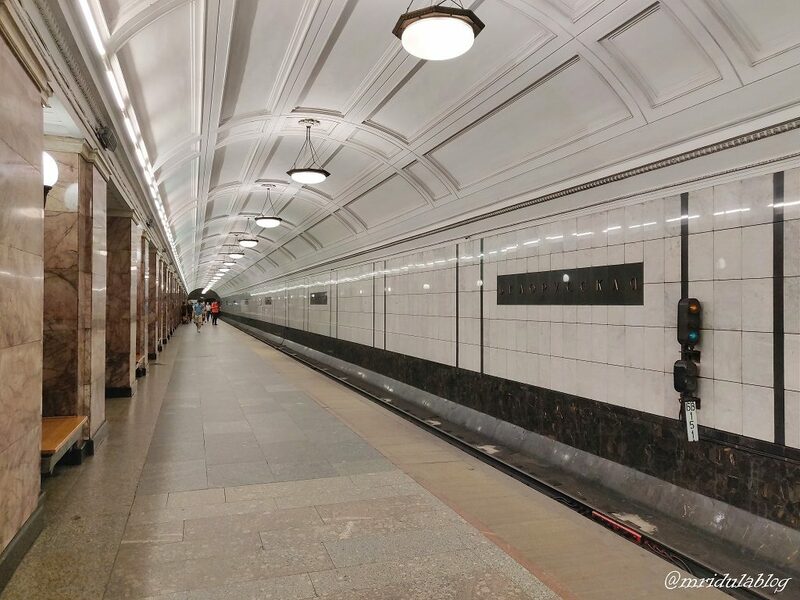 Belorusskaya on Green Line may not be as beautiful as Belorusskaya on Circle Line! For most of the time it was okay, I have anyway seen the rush hour at the Delhi Metro. It was only once near the Gorky Park at the Park Kultury metro station I saw some serious lines! Why do my pictures do not look like the ones in postcards/internet? There could be many reasons for this. Many of the postcards are minus the crowd. That can be done only by shooting in very early or late hours or by digitally removing people from them! Also if you click at the stations now you are bound to catch some of the signage at the stations which you will not see in the post cards. How do I pronounce the names? That is the tough one, but you really don’t need to pronounce the names as you can by the tickets by the number rides you need to take. I used the Yandex Metro app and it works like a charm. 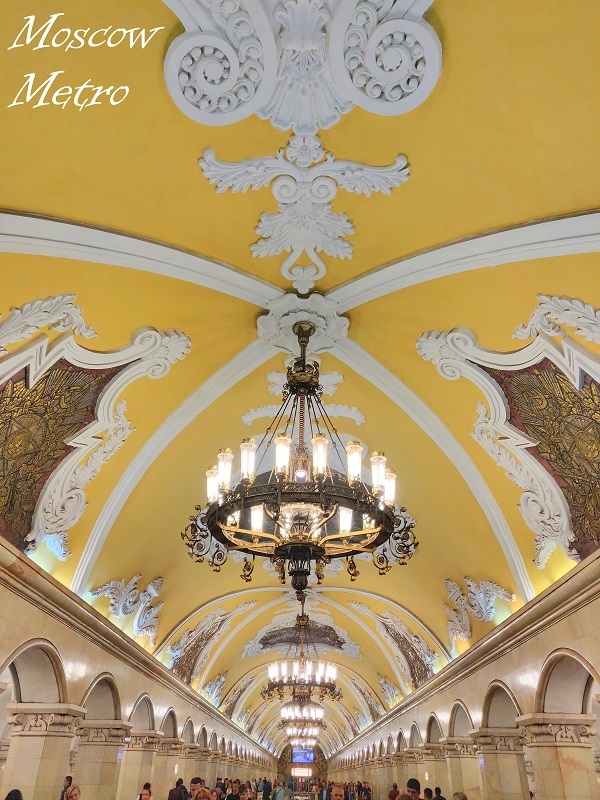 Moscow Metro Stations are so beautiful, they make the mind boggle! Also there are so many of them which are so beautiful. Tour operators offer tours of the metro stations in Moscow. But I would say you can easily do it on your own with a bit of research. It is also easy to use the metro as the signs are in English. PS. You can read all my #themetroproject posts from this link. 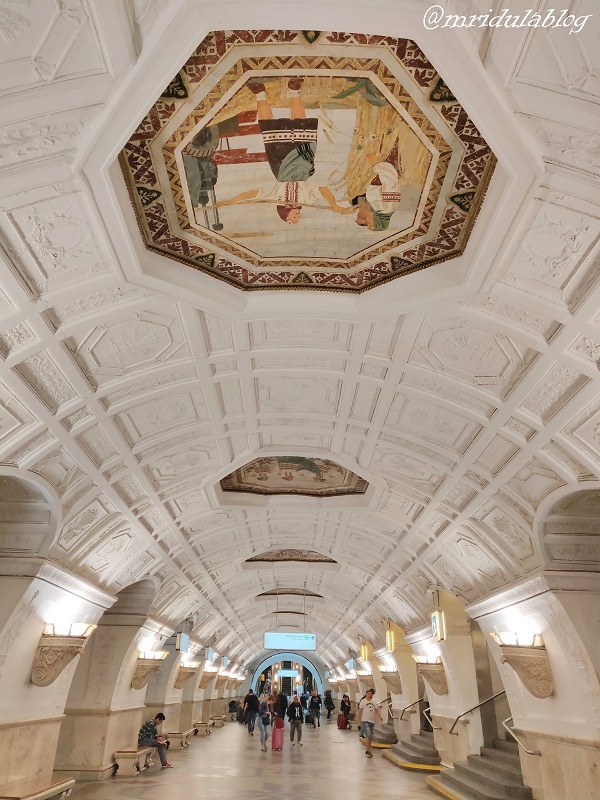 It is good that Moscow has such beautiful metro stations…i mean why NY should have all the fun. 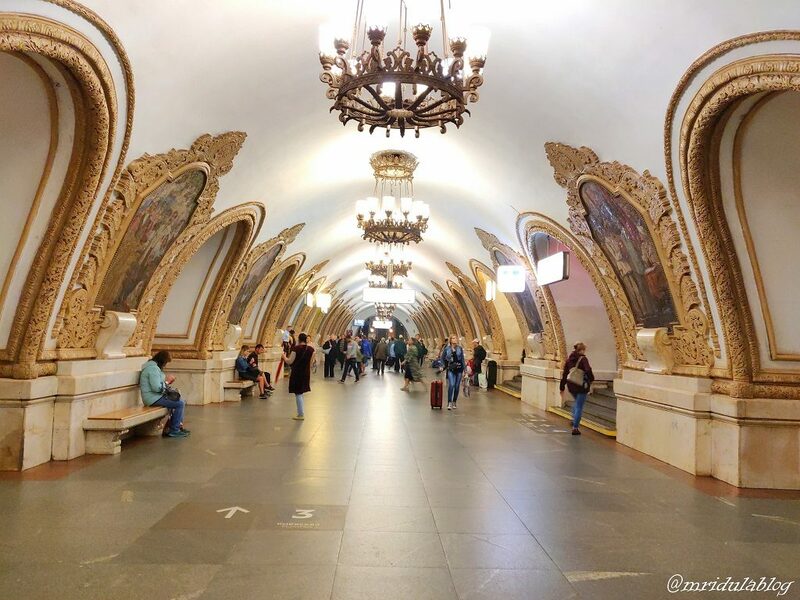 Hi Mridula, Very refreshing and informative post about Moscow Metro .After reading the translated ‘Soviet Desh’ magazine and Russian children’s story books , I craved to visit Russia-USSR. 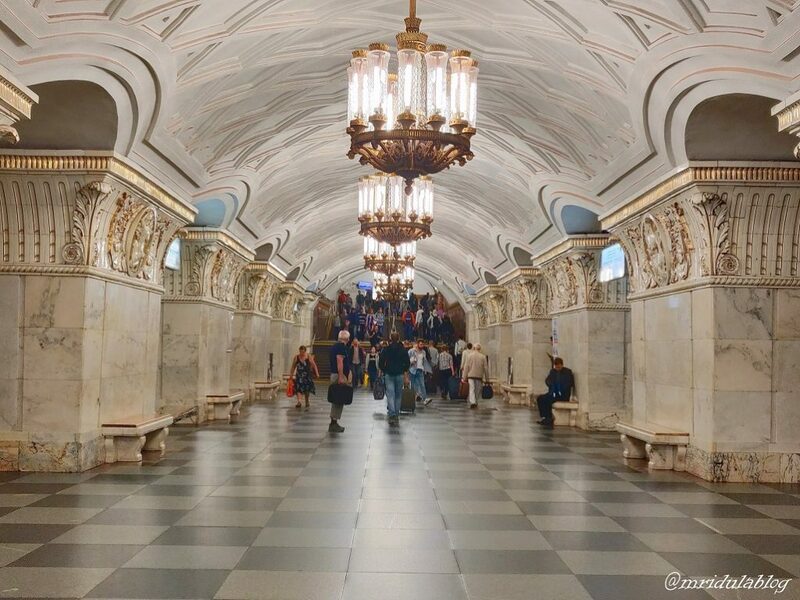 Now after decades, my wish to visit USSR is rejuvenated,due to your royal pics of Moscow Metro. 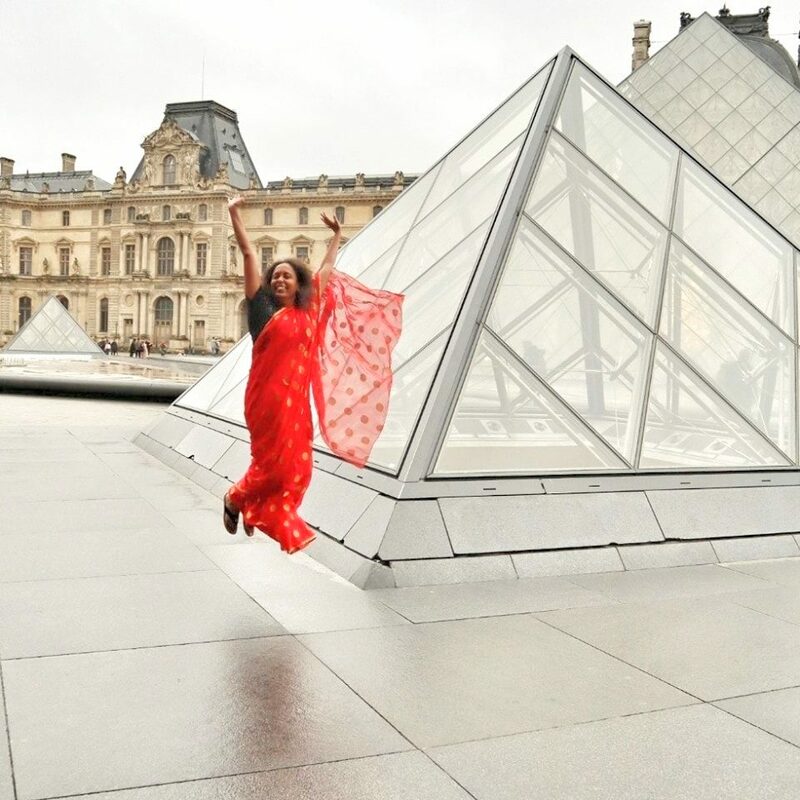 I hope you will go there soon Sujata! The stations are so clean. It feels like one can spread a mat and sleep over there. The pictures are amazing. Buying ticket per number of rides sounds super convenient. I agree Jheelam, buying tickets by rides was convenient, otherwise imagine my plight trying to say Novoslobodskaya! I so agree Rupam! Moscow Metro was amazing! “Friends commented that they look like the lobby of a five star hotel rather than a metro station! And they are right!”- Wonderful pics! Useful info- no daily pass kind of concept with unlimited rides?